It’s been a while (in Eurovision time) since Albania became the most recent country to make their 2012 entry official – but don’t lose hope! We are nearing the next national final, and after that the season is in full swing, with February looking as Frantic as usual. My favourite entry: Tell Me Who You Are by Malene Mortensen (2002). Yes, really. I will never understand how this, one of the early favourites, ended up dead last, even failing to beat Francine Jordi and the Greek Terminator (see my last post). My least favourite entry: In A Moment Like This by Chanee & N’evergreen. Yes, really. There was only one artist with ‘green’ in their name that should have made the top 5 in Oslo. FYI, it was the Welshman singing for Cyprus. More of the memorable: Dansevise by Grethe & Jørgen Ingmann (1963); Fra Mols Til Skagen by Aud Wilken (1995); Fly On The Wings of Love by the Olsen Brothers (2000); Never Ever Let You Go by Rollo & King (2001); and Talking to You by Jakob Sveistrup (2005). Their best stage show: DQ by Drama Queen (2007), of course! If you define a great stage show as one that features a gigantic something or other (like Armenia do) then you’ll have to agree with me. If you also define it as one featuring a costume reveal or two, then JACKPOT! Their best costume/s: I have to admit that Chanee & N’evergreen were well dressed. However I am giving this award to Jakob Sveistrup and his troupe of Merry Men. I wonder if they kickstarted the red/pink trend? "MWAHAHAHAHA! In your FACE Chanee & N'everwhatever!!" 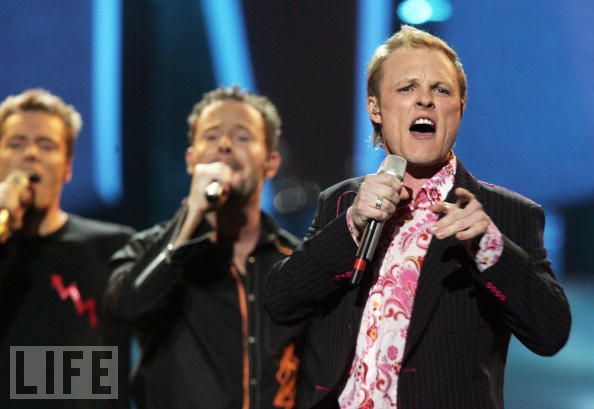 Their best vocalist/s: Hot Eyes (1984, 85 and 88) OR Ronan Keating (2009). I mean Brinck. Obviously. 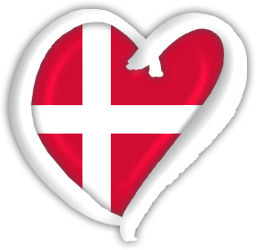 What I love about Denmark in the ESC: They may be Scandinavian, but they aren’t even close to being a one-trick schlager pony (not that I mind recurring schlager. Or ponies. In fact, I’m very fond of both). Over the years there’s been everything from hypnotic ballads and odes to telephone operators, to retro pop, auto-tuned love songs and stadium anthems from Denmark – really, everything short of hard rock performed by masked monsters (Finland’s got the monopoly on that one). No matter what genre they gamble with, it usually pays off. After a bit of a slump in results during the mid-to-late 2000s, it looks like the Danes are back in top form with two successive top 5 results in 2010 and 2011. Could it be third time lucky in Baku? What’s your favourite Danish entry of all time? Posted on January 14, 2012, in Country profiles, Eurovision 2012 and tagged Baku, Chanee & N'evergreen, Denmark, Eurovision, Eurovision winners, history, Jakob Sveistrup, Malene Mortensen, Oslo. Bookmark the permalink. 2 Comments. Denmark is utterly the most bland country in ESC. Well, IMO 50% of San Marino’s entries have been blandtastic. Not that that’s a huge deal =P But I’d agree there are plenty more exciting countries!